MANSON — The Lake Chelan Shore to Shore Marathon, Half-Marathon and 10K is pleased to announce that North Cascades National Bank has signed on as the presenting sponsor for the Sept. 8 event. The bank has helped sponsor the running and walking event in the past. But this year it decided to increase its level of support. North Cascades National Bank joins a growing list of other event sponsors, including Lake Chelan Community Hospital, Black Diamond Physical Therapy, SET Coaching, the Lake Chelan Chamber of Commerce, Libke Insurance, and GU Energy Gel. 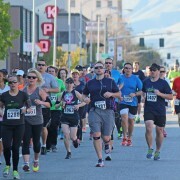 The Lake Chelan marathon and half-marathon courses begin on the lake’s south shore and follow the shoreline through Chelan and then on to Manson on the lake’s north side. The marathon, a Boston-qualifier, begins with rolling hills for the first few miles and then is mostly flat, while the USATF-certified half-marathon is flat. The 10K run begins in Chelan and ends in Manson. For more information on North Cascades National Bank: www.ncnbank.com. For more information on the Lake Chelan Shore to Shore Marathon and Half-Marathon: www.lakechelanmarathon.com.